Dawn’s primary interests as a kid were athletics. Run Down in the Street? A person tries to get from one rock to the other without getting tagged out. She went to a small school – 38 people in her graduating class. They had one accounting class. She had to tie out and match up various ledgers. Dawn loved the idea of “the puzzle” and at age 16 she knew she was going to be an accountant. She knew what she wanted to do by the time she went to college. She was recruited for sports. She graduated in 4 years! Most people these days do the “wonder plan” – wonder when I’m gonna graduate. At first Dawn graduated (in 92) From Eastern Connecticut State University, then she went and started a family. In 1999 she started a bookkeeping business. Later on Dawn went to take the CPA exam. 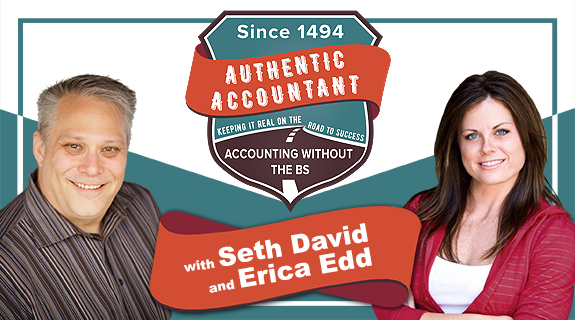 The CPA exam process is very different today than it was when Dawn and Seth originally took it. You have 18 months to pass, and you can take 1 (of 4 total) part at a time. Dawn did not do so well with home study. She went to a “live” class where she was able to watch the video with other people in the room. Dawn passed the first one with a 75 exactly. She printed 100 copies of it! She passed 2 other parts, and still had to take Auditing. She took it on the last day of the 18 months, after which she would have lost credit for 2 of the parts. When Dawn first had kids, she was surprised they let her take them home from the hospital. They were also building an apartment for her in-laws. The guy who was doing the construction work was losing his bookkeeper, so he asked Dawn to do it. At that time Dawn’s husband got a construction gig, and Dawn needed a computer. So she worked for her husband to earn the money to buy her computer, so she could do the bookkeeping gig. She got a brick of a laptop. She did no research. She walked in, saw a green box, and it was QuickBooks! This was 1999. Next she realized that she should probably get a Masters. So she went back to school part time and also formed a partnership with a few other people. Ultimately the relationship didn’t formulate the way that she had hoped. Dawn came out of this in 2005 knowing what she wanted to do. She wanted to do hosting, for example. So what were the struggles along the way so far? There was no formal training. Dawn had to teach herself just about everything. She had to figure it out herself. There were no procedures. She would work 15 hour days. If Dawn was stuck, she would bring her brick to bed, and stay up until she figured it out. She just did whatever it took to make it happen. Everyone should do hosting, even if you are 100% SAAS. They go into the cloud to go into the cloud. This offers the protection that you would otherwise have to hire someone for $150,000/year to get. As accountants we have the keys to the kingdom. We have the SSN’s, DOB’s, tax records, payroll. We are a target. We all work remotely. When you leave your home office, do you lock it down? Most people are going to answer no. Dawn is now teaching bookkeepers about forensic accounting. In short this is about how to protect the assets of our clients. Knowing that every expense account is backed up by a document somewhere is one of the rules of the IRS. Most companies aren’t even close to having all of their receipts. Companies like Receipt bank should be telling us what receipts are missing. The original receipts’ ink will fade over time. You have to make a digital copy of everything. Dawn is building a sight at FIghtAgainstFraud.com. And implementing reasonable costs for internal control purposes. EG use a full service payroll company instead of having a bookkeeper doing your payroll, you reduce the risk of someone stealing your payroll taxes.